One of the services Atlas provides for the BBC is to supply their huge amounts of great content into Radioplayer. Radioplayer is a fantastic product, providing a single search and defined player experience for almost all UK radio. An incredible platform for cross-industry syndication, Radioplayer also provides the search within the player on the BBC’s own site. Users can be on the website for one radio station and find content from another, the console automatically switching to become the other station’s player. This makes Radioplayer a very important discovery mechanism, making it crucial to have as much of your content in the search as possible. Recently we worked with the BBC to increase their visibility in Radioplayer, by adding their full archive of available and newly published audio clips, which now appear in addition to their broadcast and catchup radio programmes. The great thing about most BBC clips is that, unlike the programmes they come from, they are available forever. Since production teams are producing many such clips every day, there is a vast amount of untapped, always playable content that we wanted to help make more widely available. These clips are often guest interviews and other interesting, highly searchable bits of shows, so they come up for a huge variety of search terms. This means the BBC now ranks highly in Radioplayer with real, playable content in searches for huge numbers of people (be they artists, celebrities, politicians), places and subjects. 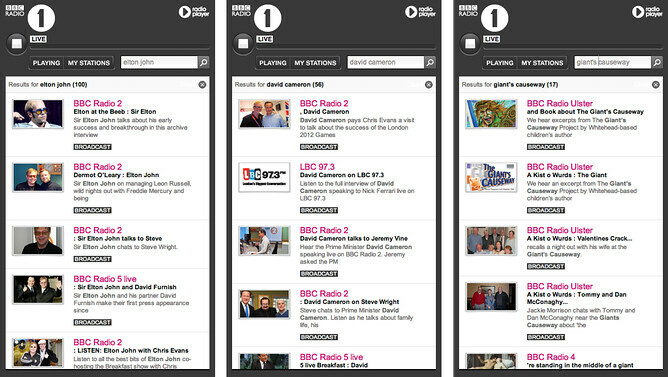 By adding their off-schedule content to Radioplayer in addition to their catchup programmes, the BBC now consistently returns many items of playable content at the top of the search results pages for a huge variety of search terms. When you bear in mind that these results also appear identically in the online players of other radio stations, it’s clear that off-schedule content can be a huge driver of traffic and audience reach. With the help of Atlas, the BBC now provides something always available to listen to in Radioplayer for almost any topic. And that’s really very exciting.